NEROBOVE, the name of the Sicilian band that has appeared frequently in my weekly researches, first by the attractive cover, by the concept of photos and I believe that the band has put a great effort for the divulgation. From here it is a step until arriving in the ears of the lovers of Death/Thrash metal, it is exactly at this point that I got the first contact with the sonority of this new band that arrives at of 2018 excelling a masterful work and without measuring efforts. 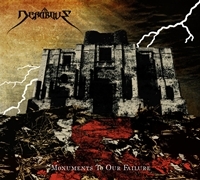 Exactly that, we are talking about the debut album "Monuments to Our Failure" releasing independently on June 9 and with the band attitude from years on the road. I say this because we speak of a powerful album that puts in shock the best elements of both styles, all adding up to literature and the musicians' own personal experiences and efforts. Although it is not a colossal album in number of tracks, counting on only seven, we can consider it giant in the quality question, of production, composition and by the effort employed by more this band that proves that who really wants to do something does , going from the explosive "Nekyomanteia" which features a really melancholy brief introduction to the bursting riffs in profusion, retaining a great personality, to the final track on "Gloomy Sunday" with all its plane floating between melodic Death/Black and an atmosphere unusual. This is an ambitious work that captures so many different elements that each track becomes a surprise. Although the vocal lines have not yet reached a fair level, remaining as a block too solid for a perfect fit in the instrumentation, yet the whole set works very well. Perhaps it is the hidden experience of "See You Leather" times, a beginning hidden from the band in 2012 that brings in their history only a Single and EP or the fact that they have different influences hovering over their heads. It's an oscillating album, reminiscent of bands from the Bay Area in moments of "Not Waving but Drowning" with guitars and drums colossal, to moments of Death with Progressive elements like in "La bête humaine", and curiously use Italian for the interpretation of the lyrics almost sounds as good as the English itself, I must admit that this guarantees an identity for the band. "Anamnemesis" is another devouring track. This really reminded me of SEPULTURA in some moments and in others everything seems to have become a great field of experiences as in "Diluvio" by the way this track reminds me a lot Ivan Ferrús. It is evident that the whole region of Italy, Spain and the surrounding area is gaining more and more space within the world scene and "Monuments to Our Failure" is an album that I particularly recommend for 2018. I am looking forward to find out what this band will do next.